STUDIED: BA Architecture at the University of the Witwatersrand, Architectural Diploma from the University of Westminster, PhD in Architectural History and Theory at the University of Westminster. WORK: In Cynthia Poole’s latest body of work ‘Gold Pieces and other Explorations’ she retains her pop art tendencies, focusing on ordinary objects devoid of surrounding context. She explores the capability of gold leaf and gold pigment using it in a contemporary style. 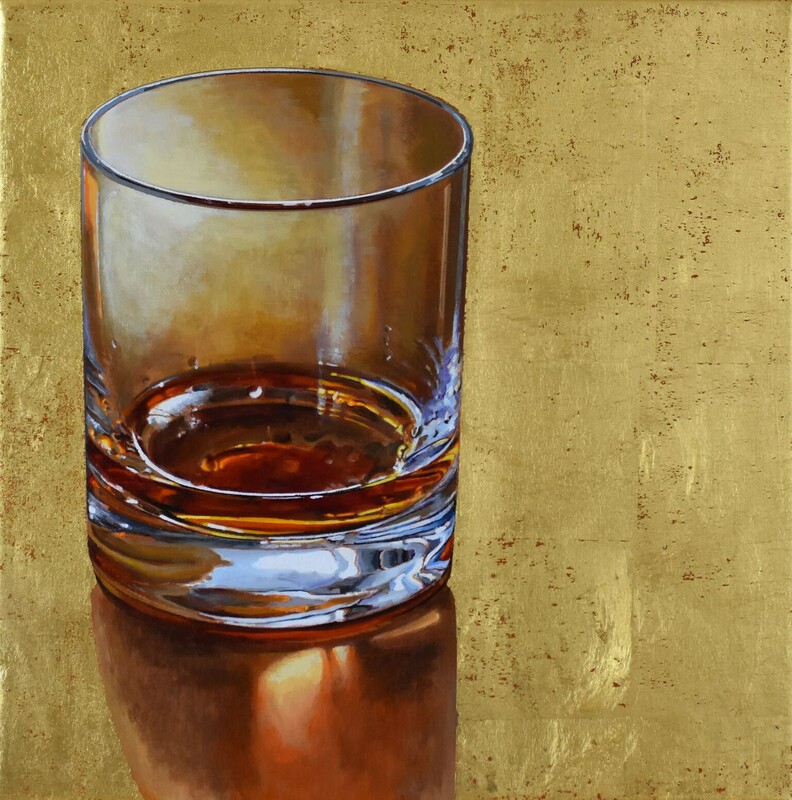 Poole was intrigued to learn whether her subject matter and her style of painting could work harmoniously with the traditional quality of the Gold Leaf. Other recent works are inspired by Giorgio Morandi’s still lifes; they respond to the compositional elements Morandi employs and provide a calm contrast to the ‘gold’ pieces. Throughout her artistic practice, Cynthia Poole has been interested in mass produced, every day, modern items; objects that you would instantly recognize. Her new series of works is no different in that respect, including iPhones, Coca Cola cans and tins of baked beans. Poole’s latest works are inspired by Morandi and a collection of Medieval gilded wood sculptures she came across after a visit to the Unterlinden Museum in Colmar. Whilst the themes, structures and tools used often overlap, individually they explore different themes, materials and make different art history references. Poole is particularly taken by the distinctive way he arranges objects and the impact his quiet paintings can create, well beyond their subjects. It is evident in Poole’s still life experimentations ‘Deliberate Arrangements’ and ‘Metafisica’ that she was inspired by the curiously permanent, eternal feel of the way Morandi arranges his subjects and a variety of techniques are put into place to generate these intriguing works. Poole’s new use of gold leaf pays homage to a number of different artists ‘Extremadura’ for example was inspired by Francisco de Zurbaran’s ‘A Cup of Water and a Rose’. After her initial curiosity, Poole began collecting instances of modern usage; Klimt and Rauschenberg being two examples. Some of the works respond to the religious significance seen in traditional gold leaf paintings, replacing classical iconography with contemporary alternatives. Cynthia Poole, was born in Zimbabwe and originally trained as an architect. She worked in London at architectural practices including Richard Rogers, Nicholas Grimshaw and Norman Foster. Within her painting career, Poole has been inspired by the ‘Purism’ of Le Corbusier, in her words, ‘an underrated painter of still life’, Piero della Francesca, Jan Vermeer, Frans Hals, Vilhelm Hammershoi, Morandi, de Chirico, and Wayne Thibaud. A Large proportion of Cynthia Poole’s paintings are of chocolate bars and crisp packets, either in shops shelves or vending machines. Here she explores their vivid colour and strident competitiveness. 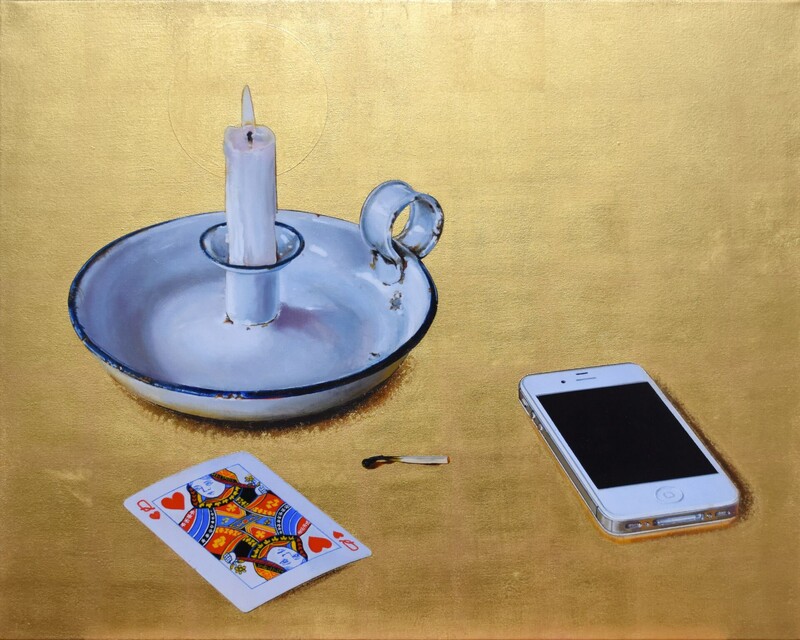 Still life appeals to Poole because the domestic objects she depicts are full of information about their pictorially absent owners. The Pyrex jug, with its manufacturer’s label and volume markings is a good example of this kind of informative object. The jug is not just a container for liquid, the markings imply more strenuous culinary activity, and the logo shows it to be a mass-produced, commercial item. Cynthia Poole’s solo exhibition ‘Gold Pieces and Other Explorations’ opens with a private view on the 14th March 6pm – 8pm. The show runs from 15th March – 15th April 2017.